Albums, storybooks and presentation products for your wedding day memories. So we’ve captured your day, now it’s time to think about how you want to view and share your special images. 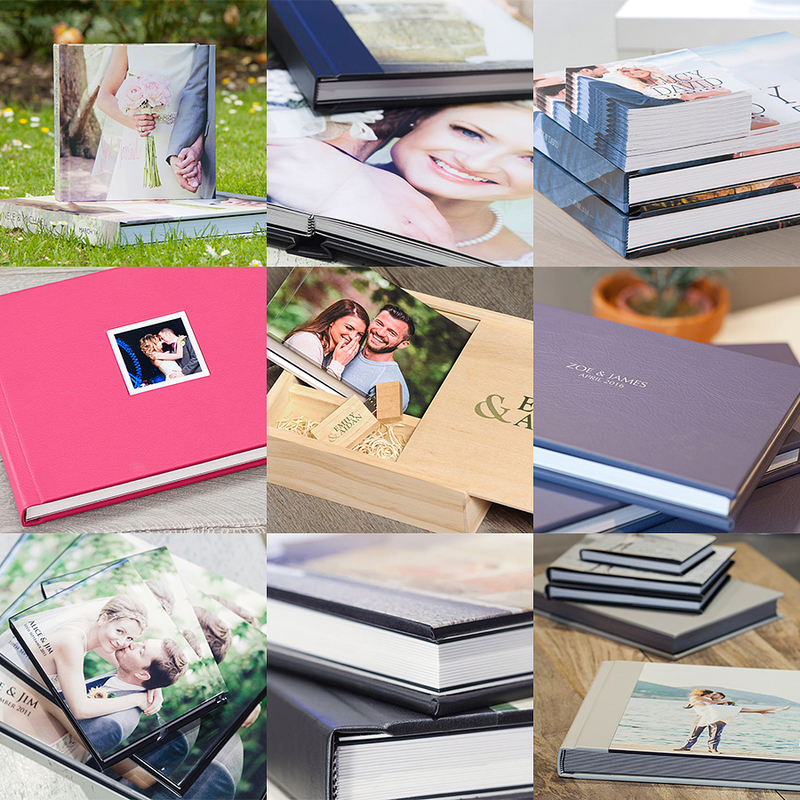 We have a range of wedding albums, storybooks and presentation products to compliment your wedding photography. These may be added to your package at the time of booking or, if you choose to create your own package these may be ordered directly from your online gallery after your wedding day. I offer a viewing and design service for albums and storybooks, if required. Please ask for details. We have a selection of packaging options for your USB presentation depending on your wedding day package. This includes our popular vintage tins, presentation cases, wooden and vintage style boxes. All our USB packaging is personalised with your selected image and/or text. 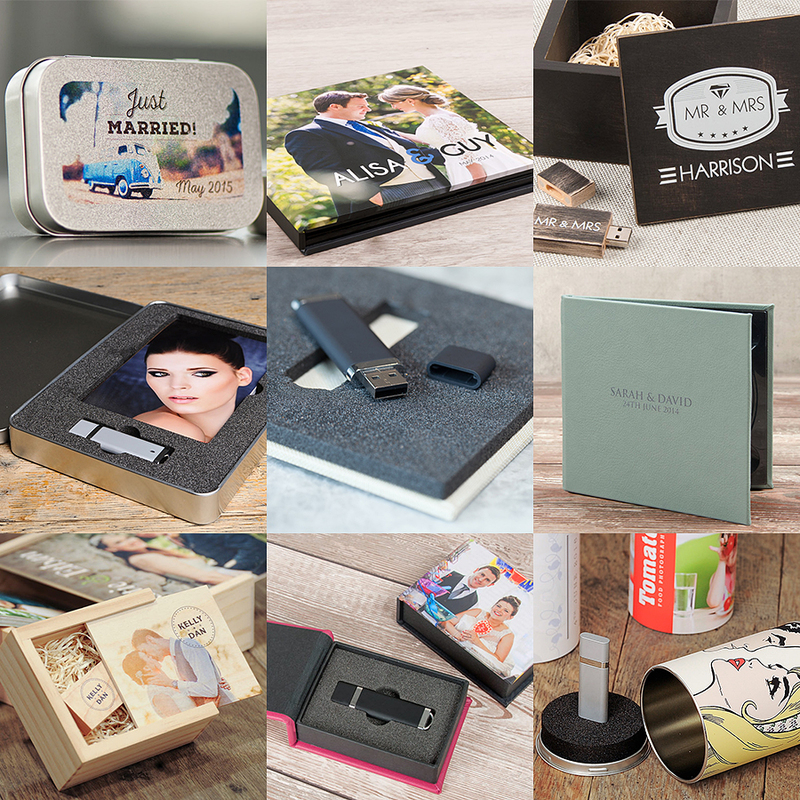 If you would like to add our *NEW* USB and Print Box to your wedding package just let us know! These boxes include your USB and up to 150 selected 6×4 inch prints. We are pleased to offer you an extensive range of albums and books to display your favourite images, to include our ‘Luxury Album’, ‘Classic Album’, ‘Wedding Storybook’, ‘Portrait Book’ and ‘Studio Book’. There are a selection of cover options, design, page styles and paper finishes to choose from. Album and book sizes range from A4 to A3 in a variety of formats. We have included a few options below but please ask for details of our full range. A beautiful 60 page leather bound, 12 x 12 inch album with up to 100 images to complement your wedding day. A beautiful 40 page leather bound, 10 x 10 inch album with up to 80 images to complement your wedding day. A beautiful 20 page, photographic, acrylic or linen cover, 10 x 10 inch album with up to 40 images to complement your wedding day. A 10 page, photographic or linen cover, 8 x 8 inch album with up to 15 images to complement your wedding day. A printed paper 40 page, photographic or linen cover, A4 album with up to 60 images to complement your wedding day. Ask us about our *NEW* Book and USB Box. These wooden style boxes include a USB of images and an A6 book with a choice of linen or photographic cover. A lovely addition to your wedding package. Please ask for details of other album and storybook options available.